In order to approve a Geography Glue account for activation, its netgroup must be designated as part of the Geography department. You do this through the Accadmin program. 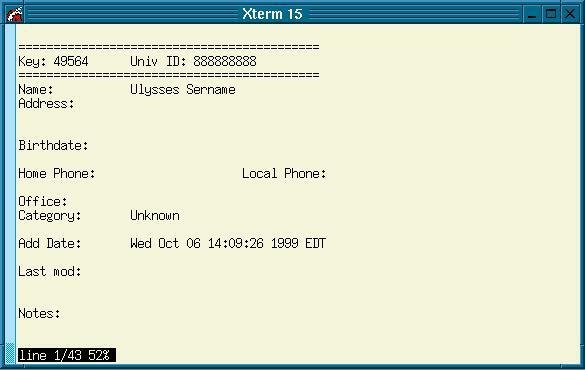 There are two paper forms used for account registration: the Unix System Sign-Up Form (for graduate students, faculty, and staff) and the Glue Network Account Sign-up Form (for undergraduate classes). The forms each ask for the University ID and username, which are the two means you have for looking up account information. Student rosters are also used for batch account approval, but the University IDs should be included on the roster. One way or another, you'll need to lay hands on the University ID (and/or username, but the ID works more reliably) of the account in question. 1. From the prompt, type "accadmin" to launch the program. 3. (a) There are four possibilities: the student could only have a Glue account, only have a Wam account, have both a Wam and a Glue account, or have neither. Two screenloads of text like the example below will appear if the student has only one account; hit the spacebar to move from the first page to the second and type q to return from these screens to the ACCOUNT> prompt. 3. (b) On the other hand, if the account exists in multiple organizations, the following screen will appear. 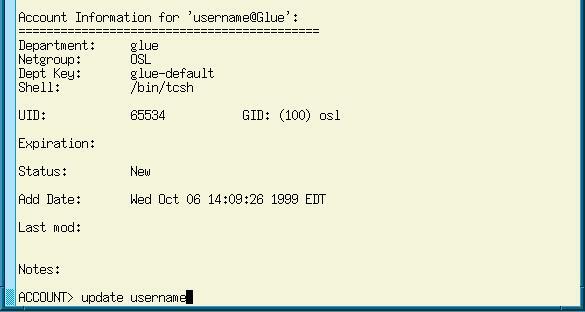 Note that the Dept is listed as glue and the Status is listed as New. We'll be changing the account so that the Dept is geog and the Status is Active. 4. To update the account, enter update username (if the user has no Wam account) or update username@Glue (to distinguish between accounts if both accounts are listed). 5. Since this is an undergraduate account, we need to change the primary Netgroup (#4), which is OSL at default, to GEOGRlab. [If it were the username of one of the faculty, staff, of students, we'd be changing to the GEOGRdept Netgroup. The procedure is the same in either case.] To do so, type 6 at the Which? (Press Return To Quit) : prompt. 7. Next, select the location of the home directory. Select people (1) if the account is for a graduate student, faculty member, or staff. 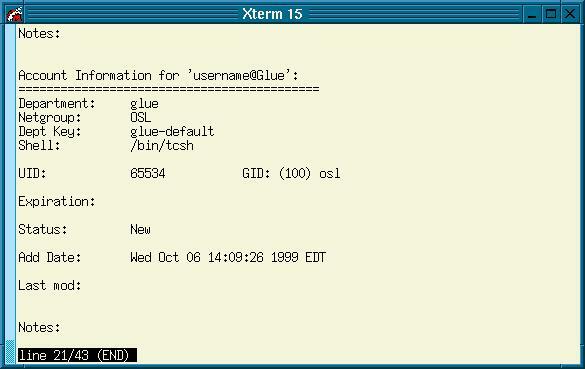 Select glue (3) if the account is for an undergraduate student taking a class in the Open Lab. 8. Press return to quit. 10. Once it's been approved, it goes to Glue for final activation, This is usually taken care of within a few hours. 11. After that, type q to quit the program.